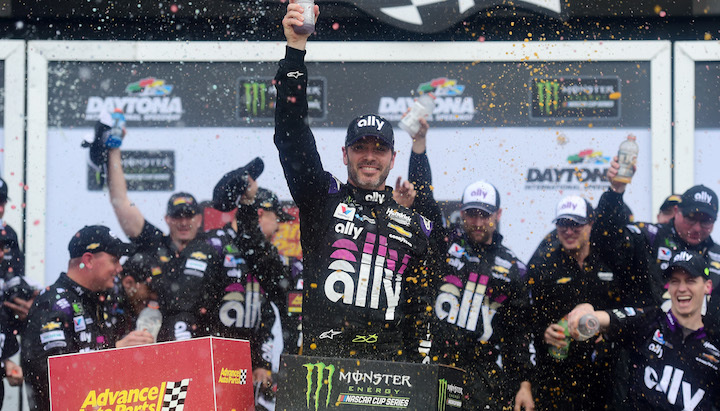 Jimmie Johnson was declared the winner of Sunday’s Advance Auto Parts Clash at Daytona International Speedway after sparking a huge wreck that collected nearly every car in the 20-car field. With rain quickly descending upon the famous South Florida raceway, Johnson attempted an aggressive pass for the lead on the pole-sitting No. 21 Ford Mustang of Paul Menard. Cutting left to the bottom of the racetrack just as Menard also made a slight adjustment to the left, Johnson made contact with the No. 21 and sent it into the outside wall. The wreck collected every car behind Menard, with only Johnson, Kurt Busch and Joey Logano emerging unscathed. Menard, who started on pole after a random drawing on Saturday, blamed the Wreck on Johnson and accused him of frequently driving aggressively at restrictor plate tracks. Johnson said the wreck was an unfortunate result of his frantic attempt to pass before the rain arrived. The race had been red flagged for rain two times previously. It was a successful weekend for Chevrolet in Daytona, with William Byron also taking pole position on Saturday for next-weekend’s running of the Daytona 500. Johnson’s old crew chief, Chad Knaus, departed to crew chief the No. 24 Camaro ZL1 for 2019, giving the former pairing of Johnson and Knaus two impressive accolades this weekend. The 2019 Daytona 500 will go green on Sunday, February 17th at 2:30 p.m. Let’s hope it goes a little more smoothly than the rain-marred and crash-filled Clash. I’m sure he’ll get him back in the future. most all wrecks at the plate tracks are caused by the spotter telling his driver “he has got a run on you” and the driver responds by throwing a late block causing a big wreck. in indy car you are allowed 1 block on a car and after that you have to hold your line . The only “right on” description of the race mishap Sunday was by, motorman,he obviously knows alot more about Nascar stock car racing then “Pete” does! I don’t care who it is, on the last lap of a dumb restrictor plate race you pull out to pass when you have gotten a push by the #1 car and when the 21 comes down to block a car with a full head of steam……………It’s happened year after year on these restricted races! same thing happen last year in the 500 on the last lap the 10 car moved up to block and the 3 car was coming with a full head of steam. You guys really need to watch the tape again…He never moved…Jimmie took him out. Anyone could see that.